Na’ima B. Robert talks with “JogonHijabi” about being chosen for a coveted spot in the marathon and her running lifestyle. Na’ima B Robert: When did you start running and why? Lynne Northcott: I started running in December 2014 after putting my name down for Race4Life the forthcoming spring. I had recently lost my maternal grandmother, Rosemary, to stomach cancer and I decided to run in her memory. Cancer has affected many of my family members and it meant a lot to me. As I started training, I realised what running could give to me personally. Running helped burn off a lot of excess adrenaline caused by anxiety and stress. I began to feel emotionally stronger. Being out in the local parks, I felt closer to nature, and subsequently closer to the Creator. My sense of spirituality and faith became stronger as well as noticing physical benefits, such as sleeping better and strengthening my immune system. Often, when out for a run, I pray, make dhikr and recite Qur’an from memory. It even helps me regulate my breathing. When I crossed the first finish line of my running career, I found a quiet spot and cried. I had achieved something. I felt very connected to God and I always remain grateful to Him, that He has given me this opportunity to help others while helping myself to be mentally and physically stronger. While out running I have also connected to myself. I talk to myself, my inner child/fitra, listen to what I need and what will help me, then I go and implement that in my life. NBR: Tell us about your running career. LN: As soon as I completed the 5km for Race4Life in April 2015 I was ready for the next challenge! As my self esteem was lifting I began to believe that I could go for another goal. I put my name down for a 10km race in October that year, running to raise money for the children’s mental health charity, Place2Be. I even got my husband, Zahid, to join me with this one. Rather annoyingly, he turned up on race day, having not trained at all and ran ahead of me all the way without stopping, telling me to keep up with him! Crossing the line in The Old Deer Park of Richmond Park, I got tingles all over my body. It truly was euphoric. I spent the next year or so just training alone, running in the park and my local area. By chance I met another runner at a friend’s house and she introduced me to a local running club. Joining the club has helped me in so many ways. The people are so friendly and there is always positive encouragement and advice. It is wonderful to be part of the running community and being a hijabi I believe I am helping to squash stereotypes and break down barriers. 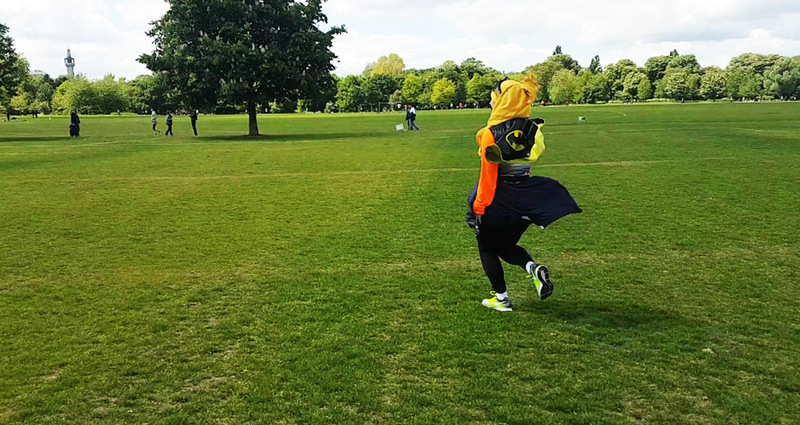 Initially, I felt a little shy joining the running community, wearing a hijab, but I soon realised that everyone was very accepting of me, so warm and friendly. I have received so many positive comments about running while wearing a scarf that I have embraced my pseudonym “Jogonhijabi”. In Ramadan a member of another local club organised a Unity Walk/Run/Jog in order to stand together following some of the terrorist attacks. My husband and I attended to show solidarity with the local community. Also during Ramadan and on the summer solstice this year I ran a special club 5km race in Olympic Park London on one of the hottest days of the year. I was the only one fasting from my club and they all looked out for me and told me how proud they were of me for having accomplished this. The main thing that got me through that race was thinking about people who are poor and thirsty who travel long distances in the heat to get water that is often not even clean or enough for their family. Running has taught me how to push myself beyond what I thought were my limits, knowing God knows what I am capable of and never overburdens me with more than I can bear. I have run several races this year with my running club as well as having joined Parkrun, a global weekly 5k event, taking place in parks all over the world every Saturday. In July this year I ran with a friend in the British 10k. The atmosphere was electric and I enjoyed helping my friend who had never run more than 5km before that day. She has now caught the running bug- it can be contagious! NBR: What is your next big challenge? LN: I am now in training for a Half Marathon this October and have so far raised £800 for Place2Be. As part of my training I have entered a 10 mile race in September to help me gradually increase my distance in a realistic way. The best news of the year just came from the “Marathon Man” himself, Haroon Mota, who ran 4 marathons in three weeks this year in memory of his father. He is from the amazing charity Penny Appeal and he called last week to give me the good news that I have won a charity place for Virgin London Marathon 2018. Penny Appeal are the only Muslim charity to attain guaranteed charity places next year so I am super happy to be granted a place with them. I was so excited to get this news and have been trying to ignore my nerves ever since. I have been praying for good health and to stay injury free, and request prayers from you too to help me on my journey to 26.2 miles, insha Allah. NBR: What are you raising money for? I have a £5,000 target to reach with Penny Appeal which will go towards a deep water well project in Gambia. This will provide fresh clean water for a community of people, meaning they will no longer have to travel far to get water. It will also help with the irrigation of their land and supply water for their cattle and animals meaning they can become more prosperous and self sufficient as a community, insha Allah. The rewards for helping me reach this target are endless alhumdulillah. The London Marathon, one of the the most famous road races in the world, is a challenge that some only dream of. It is very difficult to get a place. It is a real honour for me to have secured this place through Penny Appeal and I need SISTERS readers help and support to do justice to this. Running 26.2 miles for the first time is going to be extremely tough and requires a huge lifestyle change. This winter, when I would normally be snuggling inside with hot chocolate I am going to need to be running long distances four times a week, come rain, snow or freezing temperatures. By adding me on my social networking accounts and sharing my story you can help give me the moral support I need to get me through this difficult journey as well as reach my charity target insha Allah. NBR: How can we help? 1. Get started! The only thing stopping us is our own self. There were days I could not get out of the house to run, so I ran on the spot in my living room and did other exercises at home instead. Say “Bismillah” and go for it! 2. Set realistic targets. Gradually build up your stamina by increasing your speed or distance slowly. You will soon be smashing your goals that way insha Allah and feeling positive. 3. Do not feel guilty about taking time for yourself. With efficient time management, we can keep our other commitments and spend time with loved ones but taking time out to work on our mental, physical and spiritual self means we are going to be more emotionally well. If we give strength to ourselves, we can then give to others. Remember, a tree that is not nourished cannot bear fruit for others.